26 Assistant Engineer Jobs in this CGPSC Recruitment Exam. Candidates will be selected for this AE Jobs through written examination only. Online applications for this CGPSC Assistant Engineer Jobs Recruitment will be available from 02-11-2017 to 01-12-2017. Candidates who are qualified Bachelors Degree in Engineering they are eligible for applying this CGPSC Assistant Engineering Jobs. Other details of exam pattern and syllabus, age limits, online application form submission and selection process is given below for this Assistant Engineer Jobs CGPSC recruitment exam notification 2017. Post wise vacancies are given below for this CGPSC Assistant Engineer Recruitment Exam 2017. There is total 26 AE Vacancies in this recruitment. Candidates age as on 01-01-2017 is 21-40 years. And for reserved candidates upper age limit is 45 years. Candidate must have qualified B.E or B.Tech in Civil Engineering or Electrical or Mechanical Engineering or its equivalent from any recognized university. Selected candidates will receive the pay scale of Rs.56000/- per month. Application fee for General candidates is Rs.400/- and for others Rs.300/-. 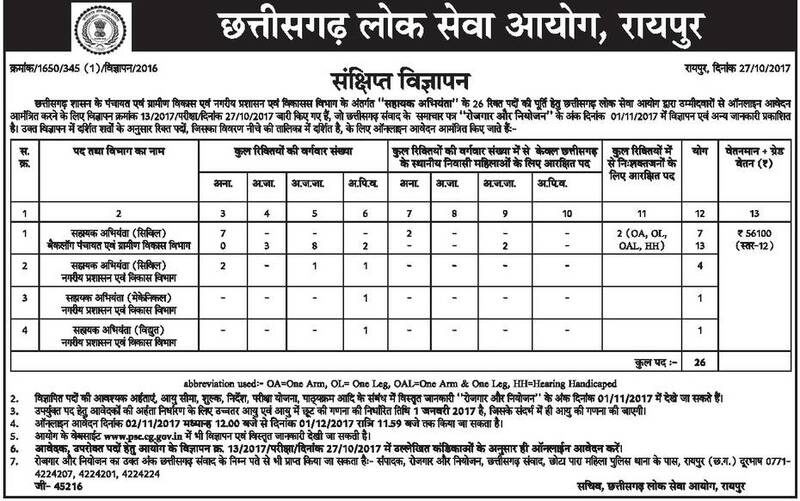 Candidates will be selected through written test only for this Assistant Engineer Jobs of Chhattisgarh Panchayat & Gramin Vikas Vibhag. 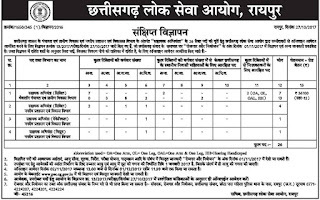 Candidates who are qualified Engineering degree in civil, Electrical or Mechanical they can submit their application form online on or before 01-12-2017 through CGPSC recruitment website of www.psc.cg.gov.in.